On your marks! Get set! Go!........Er... Go! Ok its a bit slow but good fun! Snail racing is one of those unique fundraising ideas that can really make any charity event stand out. 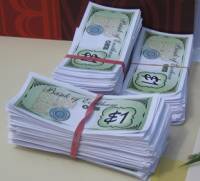 Its fun, popular and a very easy fundraiser to add to your village fair or church fete. 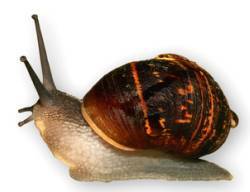 Believe it or not lurking in the undergrowth at the back of your garden are any number of racing snails. They have been working out all year and are now at a peak of fitness. "All desperate to do their bit for charity"! Collect them at night when they are out and about. You can also leave suitable snail homes in appropriate places. They like upturned bowls, flower pots etc. You need about 10 snails in good fettle but will probably want to have a few in your reserve team too. Keep them in an escape proof container with plenty of green leaved (power snacking) material in it. On the day of your race you need to paint a number on the shells of your snails. Enamel paint is fine but office correction fluid is nice and clear. Alternatively you could put a sticker on each shell but will need to check all snails are still wearing theirs before each race. Marking up the snails of course gives you other opportunities to have fun! 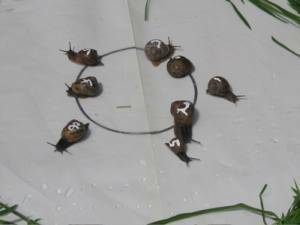 The snail racing arena consists of a simple white board covered in plastic. Two rings are marked on it. The inner ring should be about 20cms across. This is the start line. The outer ring should be about a further 40 - 50cms from the centre. This is the finish line. 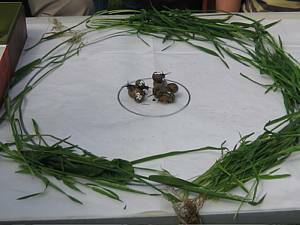 During racing grass and leaves placed on the outer ring encourages the snails to make a dash for it! If you are good at design you could decorate your board with pictures, cartoons, chequered flags etc. Giving your racing snails great names adds to the fun and encourages people to bet on them. 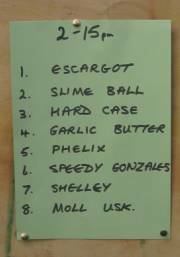 Your snails can race under several different names during the afternoon so have a different set of names for each race. You could even award a prize for the person who comes up with the best name during the event. On the day you need just the right person in charge of your snail racing. An empathy with the mollusc world definitely helps. 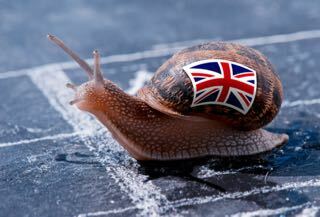 But more importantly they need to make the snail racing a really big event. All fairgrounds employ people called barkers to get the punters scurrying over. Getting the right person announcing the races (every half hour works best) and giving an exciting commentary really gets things going. Corny snail jokes are another way to 'big up' your event. There are several unique fundraising ideas you can use to make money from your snail races. The simplest is to run a simple "Totaliser" on each race. Punters back a snail with a given stake. They can back as many as they like and one snail may have many backers. 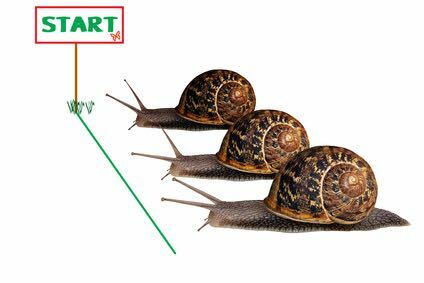 After the race half the take goes to your organisation the other half is divided equally between all those who backed the winning snail. Alternatively you could give a small prize to any winners. Offer to name them after the company or organisation. Get the local rivalries going. Imagine the local Bell Ringers beating the Towns Women's Institute by a whisker! Unusual fundraising activities can actually help build communities. Snail racing is one of those unique fundraising ideas which makes people laugh and want to join in. So if you are looking for a fundraiser that's really fun? Give it a go! But your fundraising will definitely be in the fast lane! Thanks to everyone at Eartham Fete for a fun afternoon snail racing! If you have any unusual fundraising suggestions that could help other non profit organisations please send them to us.